I have had a review copy of this book in PDF form for ages. It should have been a hot-button draw, but I just never seemed to feel like opening it on my desktop, despite its brevity. Finally, to clear up my obligation, I opened it, and found it delightful. It seems that the writer, with great sensitivity, wished to explore the imaginative space around certain historical objects, or episodes; he wanted to fantasize about the creation of art and history in a way that would feel like a real imaginative moment in the period. I found the little stories exquisite and evocative and delightful. Bravo. It is an exercise I enjoy, too, imagining the meetings in which movies are scripted, ads are planned, books are edited; imagining acts of imagination on their way to becoming realities. I always try to capture my thoughts and impressions before researching or looking at other reviews. It was gratifying to realize that despite this book's appearance of being a self-published and self-indulgent effort, Tabucchi was actually a very respected academic and writer of literary fiction, and was nearly a contender for the Nobel Prize for Literature. This book was written about 25 years ago, and only pulled into English now. Is it a coincidence that Tabucchi found his heart in Portugal, and that his post-modernism in these stories, many of which are set in Portuguese history, reminds me of Saramago? What is in the air/soil/food/water/wine of Portugal that fosters this art? My home language and culture is SO English, but I actually believe that literary art is happening elsewhere. As someone always looking for a new thrill, I am pleased to have a new author to chase down and read through. 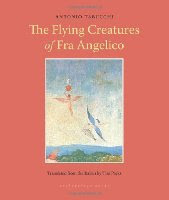 PS I have not yet found the shred of Fra Angelico that appears on the cover of the book, but I am looking. When I find it, I'll update this post.